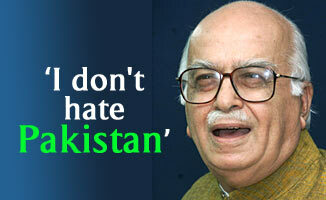 During his highly publicised and closely watched trip to Pakistan, Karachi-born Bharatiya Janata Party President L K Advani found time to speak to rediff.com contributor and GEO TV anchorman Hamid Mir on many important issues like the India-Pakistan dialogue, his opinion about General Pervez Musharraf and what he liked about Pakistan. We are going through an important phase of history, today (leader of the hardline faction of the Hurriyat Conference) Syed Ali Shah Gilani has refused to visit Pakistan and L K Advani is in Pakistan, he is declared an extremist and you are trying to look like a moderate. Is it a coincidence or some strategy that you and the anti-Gilani Hurriyat leaders from Kashmir arrived in Pakistan at the same time? No, it's neither a coincidence nor a strategy. Ask the visiting Hurriyat leaders and they will confirm that I started talks with them when the NDA (National Denmocratic Alliance) was in government and these Hurriyat leaders were happy with me. Now they are in Pakistan and I think there is no harm if India and Pakistan are talking with them. I would like to clarify that visiting Hurriyat leaders represent one school of thought in the Kashmir valley but they don't represent the whole of Jammu and Kashmir. When I go to Ladakh, they ask me that they would like to become a Union territory of India. When I go to Jammu they ask me that they want to live with India and in the valley there are different opinions, the Hurriyat Conference represents one of the opinions not the whole opinion of Jammu and Kashmir but I think that talking to them is important. Hurriyat leaders arrived on a permit in Muzaffarabad and they travelled to Islamabad on the same permit, they came here without Indian passports, what is your opinion on that issue? I would not comment on that issue. I don't want to criticise my government in Pakistan. I will do it in India. No one can deny that India and Pakistan are going through very good times, a person like you is in Pakistan and exchanging smiles with us but despite all the confidence building measures and friendship the recent talks on Siachen failed, there is no movement on the Kishan Ganga dispute and there is no solution of the Baglihar Dam controversy, then how can we resolve a complicated issue of Kashmir through talks? We must continue the dialogue process, we should not be disappointed and we should not become hostage to one problem. We should not demand time frames for the solution of complicated issues. Yes, Kashmir is an important issue but we can resolve it only through dialogue. Many people say you are a man of vision, in your vision what is the ultimate solution of the Kashmir dispute? Would you like to share it with us? There must be something hanging in my mind but I am not an ordinary mediaperson who can suggest a formula for the solution of Kashmir. If I say something it will generate another controversy and it will create problems for the peace process so I will not disclose any formula. Does that mean that you have a Kashmir formula? May be but I will not speak on that. You started a dialogue with the Hizbul Mujahideen, they also announced a ceasefire but within a week your talks with them failed, what went wrong? I don't want to start a new blame game, let us look towards the future, we should not speak about the past. Do you still support talks with Kashmiri militants? There is no harm in talking with them but they must put down their guns at least for the time in which peace talks are going on. You won the 1998 general election being a non-secular party, but you lost the 2004 election because you were trying to project a secular image, will you go back to the 1998 position in the next election? No, no we never opposed secularism. We have always been committed to the secular Constitution of India. There was no contradiction in our manifesto of 1998 and 2004. You promised to your voters in 1998 that you will a build Ram temple in Ayodhya, what is your stand now? As I said earlier that the demolition of the Babri mosque was the saddest day of my life. The issue of the Ram temple must be addressed through democratic ways, through political means, nobody should be allowed to take the law into his hands. Who protected the culprits involved in the demolition of the Babri mosque? Who protected them, I never protected them. It was the duty of the then government to arrest and produce the culprits in the court of law. Some people complain that the BJP has plans to demolish mosques in different parts of India? Rubbish. Yeh jhooth hai (This is a lie). The BJP is the victim of a misinformation campaign. Our enemies are trying to tarnish our image. It's a conspiracy against the BJP. Who is hatching that conspiracy against you? I don't want to mention their names but it's a conspiracy. Why did you hatch a conspiracy to assassinate Mohammad Ali Jinnah in 1947? It's another baseless allegation against me. I deny that. But your name was mentioned in the police investigation. Who hatched that conspiracy? I don't know. I respect Jinnah. He created Pakistan single-headedly. A lot of people have the opinion that you are the only person responsible for the failure of the Agra talks in 2001? Why are you talking about the past? It will not serve today but I can say that the Indian Cabinet at that time took a decision. It was not a decision of an individual. It was the decision of the whole government but I don't mind these allegations. I would like to (make it) clear that I suggested (to) Mr Vajpaee in 2001 to invite General Musharraf for talks in Agra. Some people in the Cabinet opposed my proposal but Mr Vajpayee took a decision with my support. Many people don't know Bhagat Singh in Pakistan, you have praised him in Islamabad, how can you praise a person who attacked the Parliament building in Delhi with a bomb and killed a police officer? Yes you are right. Many Pakistanis don't know Bhagat Singh. He never attacked the Parliament building with bomb; it was only a firecracker. He was a freedom fighter. He was hanged in 1930 and I would like to celebrate his 75th death anniversary and that's why I mentioned his name because he was hanged in Lahore. He is our common hero. We must explore our common heroes who fought against foreign powers from 1857 to 1947. Do you see any threat to the peace process, if something bad happens tomorrow what would be the future of the India-Pakistan talks? The people of both countries have taken over the peace process; nobody can sabotage the peace process. I don't see any major threat. Do you trust Musharraf completely? It's a strange question. Certainly if both the countries are talking to each other and I have also met Musharraf here then I trust him. What is the difference between the Musharraf of yesterday and the Musharraf of today? What is the difference between yesterday's Advani and today's Advani? I can claim that what I am today I was tomorrow. I have not changed. I am a misunderstood person in Pakistan. I think that a modern and prosperous Pakistan is in the interest of India. I don't hate Pakistan. Do you like anything in Pakistan? Yes, Malika Pukhraj was my favourite Pakistani singer. I invited her in the 1970s as the information minister. I liked her geet, Abhi to main jawan hoon. I like Mehdi Hassan. At one time I was a great fan of Pakistani television dramas. I remember a drama Tanhaian and Somander and I remember one actress Marina Khan. She was my favourite. I like Karachi where I spent the first 20 years of my life. I still meet some old friends in Mumbai and Goa who spent time with me in Karachi. One old friend from Karachi met me in Israel. I enjoyed visiting Islamabad, Lahore and Karachi. I will come back to Pakistan again. Advanji whatever the issue but we think that you are one of the great indian patriot but now we regreting about our feeling towards you.